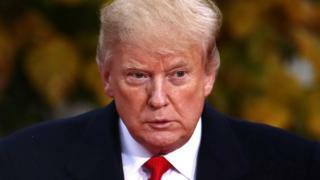 Image caption Mr Trump tweeted that those involved with the Russia probe were "a disgrace to our nation"
US President Donald Trump has attacked Robert Mueller's investigation into Russian interference in the 2016 US presidential election, calling it a "total mess" and "absolutely nuts". He tweeted on Thursday that investigators were "threatening" people to provide "the answers they want". "They are screaming and shouting at people," Mr Trump wrote, adding that no collusion between his election campaign and Russia had been found. He says the inquiry is a "witch hunt". The US president has previously said the special counsel investigation led by Mr Mueller, who is a highly regarded former head of the FBI and a Republican, was unfair and dominated by "hardened Democrats". After Trump fires Sessions - is Mueller next? In Mr Trump's latest tweets, he describes Mr Mueller as "conflicted" and says that those involved in the long-running probe "are a disgrace to our nation". The president later tweeted that Mr Mueller and "his gang of Democrat thugs" were destroying people, and blamed social media tech giants for unfavourable coverage towards his administration and the Republicans. "Check out how biased Facebook, Google and Twitter are in favour of the Democrats," he wrote. Donald Trump is back on the attack against Robert Mueller's special counsel investigation. After a brief mid-term interlude that included dire warnings about refugee caravans in Mexico and mix-and-match endorsements of Republican candidates, the looming Russia investigation is back on the president's mind - and his Twitter feed. Mr Trump may simply be reflecting the growing sense that Mr Mueller is poised for new action after a pre-election quiet period. Rumours and reports have swirled of impending indictments and late nights at the special counsel's office. There's also the possibility that the president knows something new - either passed along from his lawyers or allies under investigation, or from his newly appointed acting attorney general, who the New York Times referred to in September as the White House's "eyes and ears" in the justice department. It's been a quiet few days, but that seems certain to change. Following this decision, Mr Trump told the New York Times: "Sessions should have never recused himself, and if he was going to recuse himself, he should have told me before he took the job and I would have picked somebody else." Mr Sessions' replacement in charge of the Department of Justice, Matthew Whitaker, now has the power to sack Mr Mueller or end the investigation. Mr Whitaker, who has been appointed acting attorney general, has been open about his concerns over the scope of Mr Mueller's inquiry. A team of investigators led by Mr Mueller is looking into whether anyone from Mr Trump's campaign colluded in the effort. It has been established that senior members of Mr Trump's team met Russian officials, while several of these meetings were not initially disclosed. The president's son, Donald Trump Jr, met a Russian lawyer during the campaign who was said to have "dirt" on Mrs Clinton, and adviser George Papadopoulos has admitted lying to the FBI about meetings with alleged go-betweens for Russia. Four people connected with Mr Trump's campaign and presidency have been charged and further indictments could be issued. Trump fires Jeff Sessions - is Robert Mueller next?